Michael Jackson's daughter Paris draws an Oscar winner, showrunners, and "the other Paris" around cake to celebrate her birthday. 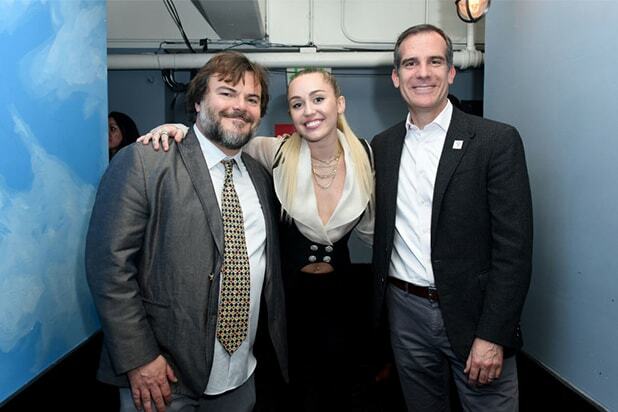 Plus: Martin Garrix toasts a new doc and Miley Cyrus gets down with the "Instagram Mayor." The reigning best actors in the industry, Best Supporting Oscar winner Sam Rockwell (left) and Best Actor winner Gary Oldman (right) were joined by Elisa Pugliese and Keegan-Michael Key at Paul Smith's dinner tribute to the "Darkest Hour" star at the Chateau Marmont on Tuesday night. The night before, Paris Jackson's 20th birthday party at Hyde Sunset in Hollywood showed that the fashion model has clout. Guests included (from left), Evan Ross, Lee Daniels, Tom Hamilton and DJ Caroline D'Amore, who gave the birthday girl a lift. For Ross (2nd from left with wife Ashlee Simpson), this is a multi-generational friendship. Mom Diana Ross and Michael Jackson were close friends and collaborators. The Hilton parents, Rick and Kathy, added an "en loco parentis" note of gravitas to the festivities. Remember when this Paris was the it-girl in Hollywood? The two Parisians posted this shot on social media. Lots more famous musical families were in town this week. Nicole Richie and Joel Madden met Frances Bean Cobain at the Daily Front Row's packed Fashion Los Angeles Awards. Chrissy Teigen, Kris Jenner, Emily Ratajkowski, Rowan Blanchard and Jeremy Scott all filled the Beverly Hills Hotel, signaling that the NY fashion world considers the long-running hotel boycott over human rights to be over. The elder Paris is now fully entrenched in the electronic music world. In addition to routinely attending EDC and spinning around the world, she turned at director Bert Marcus' premiere of "What We Started" during the recent Miami Music Week. The doc charts the evolution of dance music culture via youngster Martin Garrix and rave originator Carl Cox (right). Unlike Hollywood actors who arrive for the red carpet and intros and then disappear until the after party, Garrix sat through Lincoln Road screening.